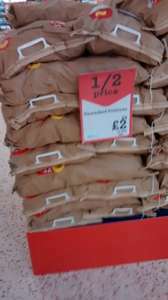 Morrison's have 12.5kg bags of unwashed Potatoes back on offer at £2.00 were £4.00. Good deal. Have some heat. Great deal - just picked some up after seeing this post. Thanks. Where can I get a potato that poops chips? Such a good Idea!!! Are they decent quality for chippy? The sack I got today were the safari variety. We tried a bag of these, about a third of the potatoes in the sack had been badly gouged by the harvesting machine. They'd have been classed as 'seconds' by a greengrocer. Not voting either way, but we wouldn't buy again. Saw these today. Great deal for the bigger family that eat a skip load of carbs. We would never get our way through this load so will stick to the smaller fresher bags. We tried a bag of these, about a third of the potatoes in the sack had … We tried a bag of these, about a third of the potatoes in the sack had been badly gouged by the harvesting machine. They'd have been classed as 'seconds' by a greengrocer. Not voting either way, but we wouldn't buy again. It is true. I had the same problem. potatoes go green way to soon these days back when 25kg would last for weeks if not months.mind you storing them in a net bag under supermarket lighting cant help. There's nothing wrong with these potatoes. Sure they sprout after awhile so does the nicely clean fancy bagged ones and they aren't over marked or damaged and all you do with a bruised/ marked potato is cut that bit out. For £2 you can't go wrong. Always made good roasties, chips and mash. Heat of course! Month after month Morrisons sell these at £2.00 so when are they ever £4.00? Perhaps it's on Sunday late for half an hour. Just a comment on their stupid Match & More card, I have more valuable things to do with my time than to find out if another store is selling something cheaper than Morrisons just to get a few points that look a lot on paper ( £1 = 1,000 Points.) but have such little value when you come to spend them. Can confirm I saw these at the local last night. I hate cleaning the potatoes even when I buy the washed ones so I had to pass on these. You get some sort of scratch or draw card if you buy from morrisons now. Don't use the self checkout whenever there is those promotions in Morrisons. They never give it to you unless you queue for a cashier. Just need to read the variety first like with the smaller bags. Amazes me how people can knock these at 16p per kg when the smaller bags are usually four times that. Can people that have purchased these, have a look on the bag & let me know what potatoes are in them please as its a bit of a drive to my nearest Morrisons. Anyone know if this offer is still on ? I bought some yesterday, so you might be in luck. Decent potatoes, not Charlottes this time! Why did this expire? It was continuous was it not?